Fun ideas for a Spiderman themed birthday party! 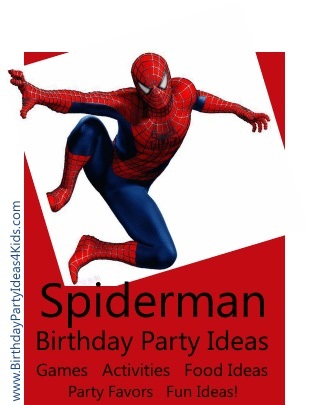 Spiderman themed ideas for party games, activities, food, invitations, decorations and more! Choose a room that is away from the main party area and string red and blue yarn across and through the room in crisscross patterns so that the yarn covers the middle of the room. Then place an item at the far end of the room (a star shaped pillow for example or a stuffed spider) and during the party have the kids line up and one by one go into the room to see if they can retrieve the item without touching the yarn. They have to go under, over and through the yarn maze. Hang up a sports net and on the side in back of the net place a large bucket or plastic tub. Have the kids stand facing the net and throw plastic spiders through the "web" to the buckets on the other side. This is harder to do then you would think ... the spiders get caught in the net. Kids will need lots of room to run and move around for this party game. Don't get caught in the sticky spider web! Kids line up in a line and clasp hands. During the game they have to keep holding hands. The first player in the web tries to touch the person that is last in the web. When the child last in line gets touched the first player moves from their place at the front to hold hands with the end player that got touched and then the they try and stay away from the child who is now first in line. Keep tagging and changing places down the web until each child has had the chance to play both positions. Have a Spiderman treasure hunt for plastic spiders. Purchase a lot of plastic spiders. For fun you can buy a few colored spiders and give away special prizes if they are found. Tell kids at the party to find all the spiders. When the spiders are found let the kids trade them in for prizes.. This is great fun for outside parties. Give each child one or two cans of silly string and then let them have a silly string web war. You might want to provide sunglasses for each child and towels for them to clean up with after the war. Draw spider webs on solid red note cards with a black permanent marker. Write or print party information on the inside. Print party information on red paper, roll up tightly and slip a plastic spider ring around the invitation to keep it from unrolling. Print out the spider from the Spiderman logo on black or silver paper and glue to red note cards. In the front yard or entrance to the Spiderman party use silly string to make webs hang from trees and the doorway. Down the hall to the party tape white crepe paper crisscrossing from top the top of one wall to the bottom of the opposite wall so guests have to weave through the "spider web". Decorate the party table with solid red table cloths, blue plates, cups and napkins and yellow flatware. Crisscross white crepe paper across the ceiling and walls of the party area to look like a giant spider web. Chocolate spiders - melt chocolate chips in the microwave then stir in chow mien noodles or pretzels. Spoon out in small clumps on wax paper and place in the freezer to harden.